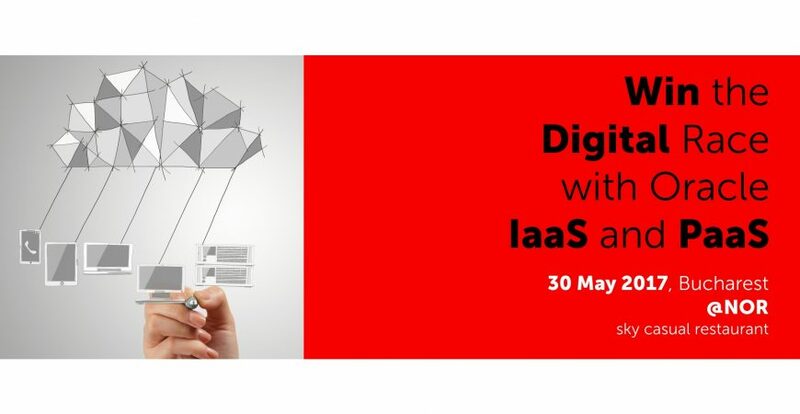 We are honored to announce the organization of “Win the Digital Race with Oracle IaaS and PaaS”, a business event that will be held on the 30th of May, 2017, starting with 09.30 hrs. at “NOR – Sky Casual Restaurant”, placed at 36th floor in Sky Tower Building (Calea Floreasca 246C, Bucharest), The event is organized by Oracle and its partner Logika IT Solutions, with the support of BusinessMark Event Management. At this event you will have the occasion to find out new ways to increase the efficiency an optimize the IT costs with the help of the Oracle Cloud products. Oracle Cloud Platform as a Service (PaaS) – helps enterprise IT rapidly build and deploy rich applications – or extend Oracle Cloud SaaS apps – using an enterprise-grade cloud platform based on the industry’s #1 database and application server. Learn how to develop, run and manage applications without the complexity of building and maintaining the infrastructure. Discover how using the Oracle Cloud, both public and on-premise, allows for higher–level programming while drastically reducing complexity. Make the infrastructure choices that are right for your business, create a strategic IT infrastructure that meets the needs of today while being flexible enough to grow with your business.